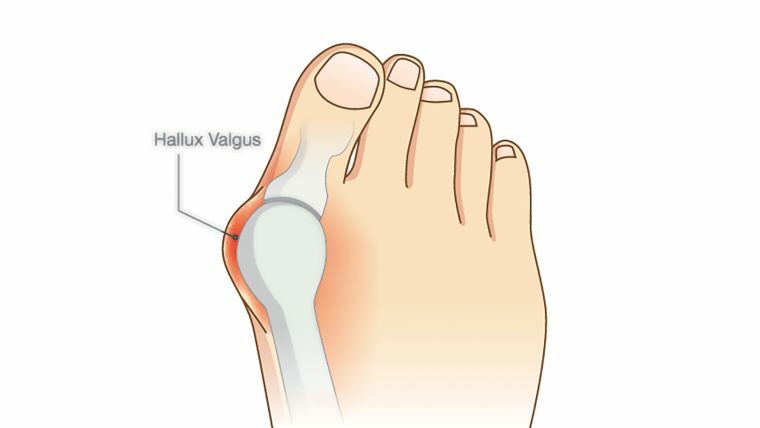 A bunion, or hallux valgus (HV), is a structural irregularity of the feet in which the big toes point away from the midline of the body (crossing over or under the second toes), and the bone at the base of the big toe (the first metatarsal head) becomes enlarged and protuberant. When bunions become advanced, they can cause pain and limit mobility. They can also affect gait and balance, and in some cases require surgery. For yogis, bunions can cause discomfort and instability in standing poses. If you find your big toes veering off course, you aren’t alone. In one large U.S. survey, 38 percent of women and 13 percent of men over 30 reported bunions. The particular deviation from neutral that contributes to bunion formation is overpronation, the inward drop of the arches and the ankles. The alignment tips in this article aim to minimize this tendency in yoga practice, and the short practice at the end works to strengthen some of the muscles of the feet and mobilize the toes in order to mitigate what Reif calls “toe drift.” For those of us with only a mild toe drift, such a practice can help to prevent bunions from forming; for those who already have prominent bunions, such a practice can prevent them from worsening and alleviate some discomfort. 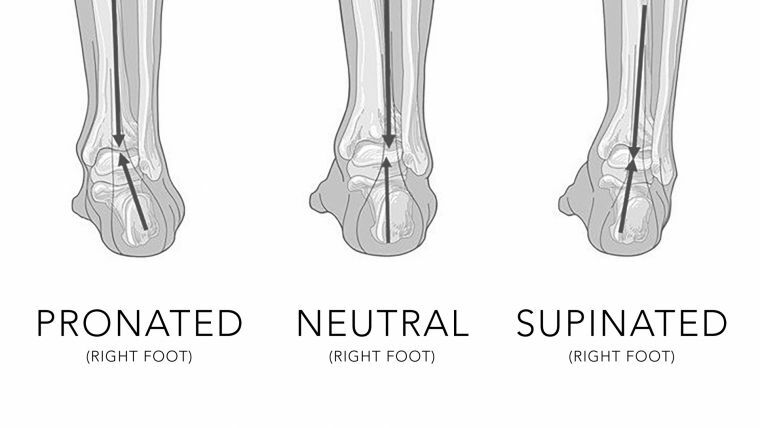 You may be wondering if your feet deviate from neutral and what exactly a neutral foot position is. According to Reif, when standing, “A neutral foot is positioned so that the Achilles tendon and calcaneus (heel bone) are vertical,” whereas in pronation, the ankle slants inward, sending weight toward the big toe and causing the longitudinal (inside) arch of the foot to drop. Feet can also move out of neutral into supination, a position in which the weight moves toward the pinky-toe side of the foot and the ankles tip outward away from each other. However, walking or performing any weight-bearing movements with an exaggerated degree of either pronation (overpronation) or supination (oversupination) can lead to a variety of problems. Oversupinating, for example, often causes ankle sprains and plantar fasciitis. According to the clinical observations of Reif and others, however, overpronation is the more common tendency—and the one that leads to bunions. Looking at bunions as part of a chain of misalignments. Yoga, mindfully practiced, can lessen a tendency toward pronation; but practicing yoga without attention to foot alignment can instead worsen pronation. If you overpronate, be attentive to these do’s and don’ts in yoga class to prevent bunion formation or to alleviate bunion pain. Don’t overemphasize grounding the base of your big toe. If you or your students overpronate, grounding the big-toe mound is likely not the most helpful instruction. “Root down with the base of your big toe” is a common cue for yoga teachers to give when attempting to stabilize students in standing poses, but asking students who are already exhibiting the effects of chronic overpronation to root down with the bases of their big toes may reinforce that problematic misalignment: They very likely will root by dropping the inner arches and inner ankles. This may indeed have a stabilizing effect, but that stability derives from a student’s collapse into an undesirable weight-bearing habit that worsens overpronation—along with the problems, like bunions, that derive from it. 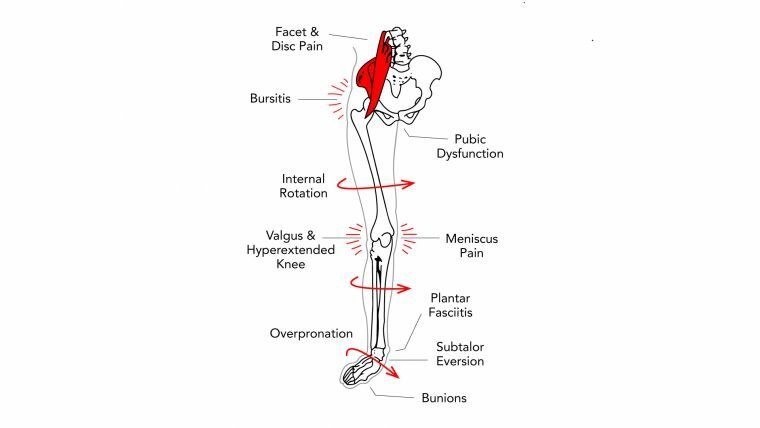 Even for students who don’t have bunions, overpronation is a common misalignment in the standing foot in balance poses; in the back foot in poses like warrior I and II, reverse warrior, and extended side angle; and in both feet in a wide-legged forward fold. In these poses, you may have noticed in your students (or in yourself) a tendency for the ankle and longitudinal arch of the foot to drop inward. Instructing students to root down the base of the big toe can move many students further in this direction. If they then maintain the habit of overpronation outside of yoga class, it can eventually lead to the foot, ankle, knee, and hip problems already mentioned. Instead, create neutral feet by repositioning your heels, and first grounding the outer points of your foot. He suggests refining your neutral feet while standing in mountain pose at the top of your yoga mat and looking in a mirror. Having a yogi friend or yoga teacher sit behind you to look at (or snap a picture of) the position of your heel bones may also be valuable as you try the following. 1. Stand with your feet hip-distance apart, their outer edges parallel to the long sides of your yoga mat. Center your hips over your heels, your shoulders over your hips, and your ears over your shoulders. 2. Lift one heel. Then place it down and “center” it so that your heel bone is vertical, and your inner arch and inner ankle have lifted. Then do this with your other foot. Establish neutral knees and hips by pressing the thighs outward more. The tendency of the thighbones to rotate inward may be addressed to some extent by establishing a more neutral foot as described above. But for some of us, moving the thighs outward until our knees point toward the centerlines of our feet will make it easier to find a more neutral foot. Once the thighs move outward to an optimal degree, it’s often easier to drop weight into the outer corners of the feet. 1. Stand in tadasana at the top of your yoga mat, feet parallel to the long edges of your mat. Lift and lower your heels as instructed above to establish neutral feet. 2. Now, exhale and bend your knees slightly, moving toward chair pose. Keep your knees moving toward the centers of your feet as you bend your legs. For many overpronators, this will entail pressing the thighs outward slightly. 3. As you inhale, return to standing in mountain, focusing on keeping your knees moving toward the centers of your feet while straightening your legs. 4. Repeat several times, noticing if this work in the legs helps to keep your feet in their neutral position. As you move through your yoga practice, keep aiming your knees toward the centerlines of your feet, being sure to watch both knees in poses like squats, and paying attention to the tracking of both your back knee and your front knee in standing poses. The five exercises below stretch and strengthen the muscles of the feet, ankles, and calves whose weakness, or tightness, plays a role in bunion formation. You’ll need an elastic resistance band (or yoga strap) and a chair. In this exercise, you’ll practice repositioning the heels, as you did above. But by doing this repeatedly, “You’ll strengthen the gastrocnemius, tibialis posterior, and soleus muscles of the lower leg. The movement here is plantar flexion, which plays a critical role in supporting a good arch,” says Reif. Since these movements require balancing, feel free to bring your hands to the back of the chair or to a wall for added stability. 1. 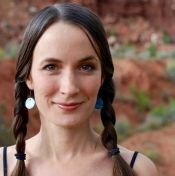 Standing in tadasana with your arms at your sides, feet hip-distance apart and parallel, lift your right heel, bending your right knee as you inhale. As you lift your heel, be sure to keep it directly behind your toes (instead of letting it veer in or out). 3. Switch sides, lifting each heel at least ten times. 4. For more of a challenge, lift both heels as you inhale, keeping your legs straight, and lower both heels as you exhale. Do this ten times. On your tenth repetition, hold your heels up for a few deep breaths before lowering your heels back down. “Lifting and spreading your toes will strengthen the abductors of your big and little toes, which can get ‘scrunched’ when wearing shoes with narrow toe boxes,” says Reif. 1. Still standing with your toes pointing forward, root down through your heels. Lift all your toes, and spread them. Keep them lifted and spread for one to two breath cycles. 2. Slowly lower your toes back down. See if you can keep them apart enough that you can see the color of your yoga mat between your toes. 3. Try to relax your toes as you root down through the balls of your feet and your heels (ideally your toes will not be turning white or creasing). Slowly lift and lower your toes at least ten times. 1. While seated on a chair, place your resistance band around your big toes (if you don’t have a band, use a looped yoga strap, or even a very strong hairband). Sit on the edge of your chair and lengthen your spine. Ideally, your feet will touch the floor comfortably. If they don’t, place blocks or other supports underneath them. 2. Keeping your feet parallel to each other, move them far enough apart that the band becomes taut and pulls the big toes toward each other. 3. Curl your toes down into the mat slightly, rooting down with the tips of all your toes (including your big toes), in order to lift your inner arches and inner ankles. Hold here for several deep breaths. 4. Relax your feet, allowing them to come closer together while you take a breath or two. Repeat the toe stretch a total of ten times. A bonus: While working to mobilize your big toe, you will also be stretching the inner thigh muscles (hip adductors), which are often tight on those who overpronate. 1. Cross your left ankle over your right knee, flexing your left ankle so the sole of your left foot faces right. 2. Root down with your right foot, and keep the right knee aiming toward the centerline of that foot. Continue to do this even as you move your attention to the left foot. 3. Grab your left big toe with your right hand, placing your right thumb at the base of the left big toe—on your bunion—and looping your middle three fingers around your big toe. Move your big toe up toward the ceiling and then back about thirty times fairly quickly, taking only a second for each oscillation. 4. Now add a strengthening intention. Activate your left foot by spreading your left toes. Bring your hands to the sides of your chair seat, keep your spine long, and try to move your big toe up toward the ceiling without the help of your hand. (If your big toe doesn't move, assist the motion with your three middle fingers, keeping your thumb pressed against the bunion.) Move more slowly now, holding each lift of your big toe for two or three breaths, and then relax. Repeat up to thirty times, aiming to get your big toe to move on its own. Practice the yoga handshakes described in the next exercise before switching to the second side. In order to create space between scrunched toes much as toe separators do, try this stretch, with your left ankle still crossed over your right knee. 1. Bring your right palm toward the sole of your left foot, then interweave the fingers of your right hand up through the spaces between your left toes, using your left hand to help you separate your toes if necessary. 2. Place your left hand around the side of your chair seat, lengthen your spine, and hold here for several long, deep breaths. 3. Untangle your right hand from your left toes, bring your left hand over the top of your left foot, and slide the fingers of your left hand through the spaces between your toes. 4. Move your right hand around the side of the chair seat, lift up through the crown of your head, and hold here for several long, deep breaths. Release, change the crossing of your legs, and repeat the toe mobilization and the handshakes on the right side. To continue countering the development of bunions outside of yoga class, if your big toe is the only one showing a “drift,” Reif recommends placing a toe spacer between your big toe and second toe when you are seated or relaxing. Reif suggests wearing such separators for at least an hour each day while seated or lying down, and adds that bunion splints or “booties” may also be helpful for some. If you are experiencing bunion pain, try ice. “Rub a cube around the bunion, or roll the foot back and forth on a frozen water bottle,” advises Reif. Those who overpronate (or who have the opposite tendency, oversupination) should not walk or run barefoot in the sand, which can accentuate the misalignment. “Better to use a sandal with good arch support,” Reif says. Whenever you stand, take the opportunity to continue to work on weight bearing and knee tracking as described above, and pay attention to how you walk: with every step you take, aiming to land on the outer heel, and then rolling weight into the pinky-toe side of your foot. Finally, press down the base of the big toe to push off. Wading in deep water might make it easier to slow down enough to observe and refine your weight-bearing habits along the course of the stride. Through such focused attention, every step may become a yoga practice.